Steven Campbell (1953-2007) died at the tragically early age of 53. Had he lived, he would have been 60 this month. 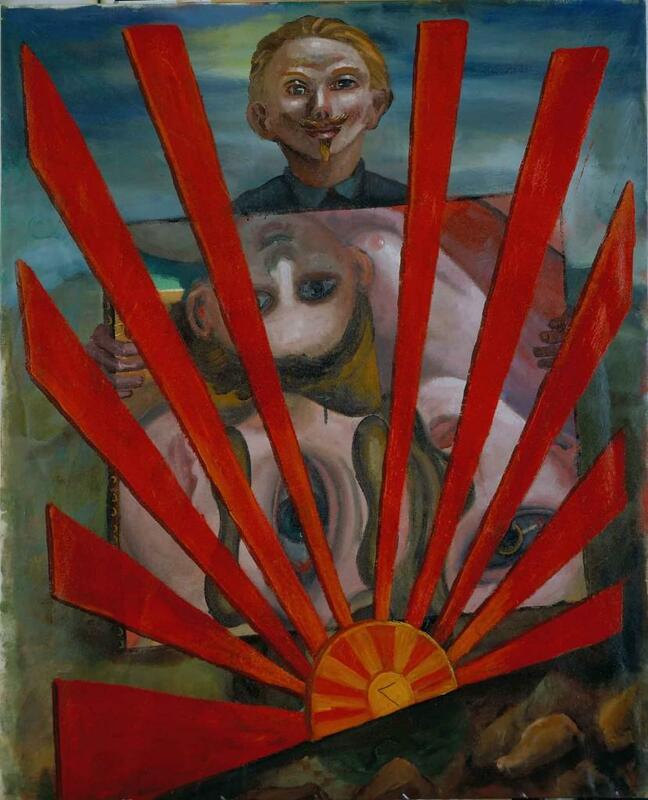 Shown here is his painting “Outside Right at Sunset Gate” purchased for the Stirling Smith collections in 1996, with a grant from the Scottish Arts Council. Campbell often used literary references as starting points for his paintings and this particular work was inspired by the poetry of Algernon Swinburne. Steven Campbell was born in Glasgow, and attended Glasgow School of Art as a mature student, 1978-1892. He gained many prizes and exhibited in New York from 1983 onwards. His style of strong, colourful, figurative work was widely appreciated, and promoted by some art critics as part of a ‘New Glasgow Boys’ or ‘Glasgow Pups’ movement. The other artists in this group included Ken Currie, Peter Howson and Adrian Wisnewski, and in reality, all of them were different. One factor which distinguishes Campbell from all the rest was that he and his family lived in Kippen, and when he was commissioned to paint a work for Glasgow Airport, the scene and theme which greeted visitors at the Departure gate was his beloved Kippen hills, stretching towards Glasgow. Like many Stirlingshire artists, other cities have claimed him, but we should remember that his world-view was also Kippen-based.